There aren’t many toys that last a long time in this household, but our Kong Wobbler has been around for years. I was hesitant to buy it at first since I assumed my dog would destroy it in minutes. But to my surprise it ended up being one of the toughest toys I’ve found. Like other food dispensing toys it’s a great (and easy) way to keep your dog busy. When I fill it up with one of Laika’s meals it will keep her occupied for 20+ minutes. 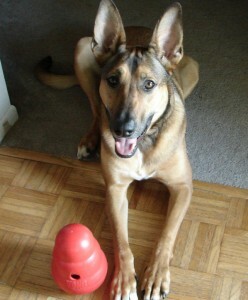 Here’s my review of the Kong Wobbler, one of the few toys we consider a must have in this house. Laika loves her Kong Wobbler. We use it for dinner everyday. 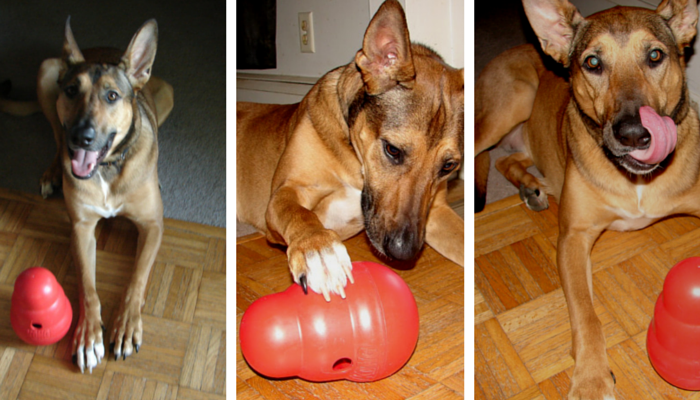 The Kong Wobbler is a dog toy you can use every single day. Even after years of use Laika still gets excited to play with it. It’s fun watching her push it around with her nose and paws. Jumping around and growling at it. She loves it; it makes eating a lot more enjoyable. She’s also getting a great mental workout while using it; something most dog owners would appreciate. A tired dog is a well behaved dog. I don’t have to worry about her eating too fast. Large deep chested breeds are predisposed to bloat, also known as gastric dilatation-volvulus if they eat too quickly. All of the excess gas can cause their stomach to turn and it cuts off blood flow. Laika is a picky eater. The Kong Wobbler solved that problem right away. She now looks forward to getting her meals and having to work for them. 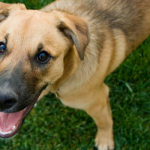 It’s amazing what one simple game or activity like feeding from a toy can do for a dogs brain. She’s more relaxed and easy going after we incorporate the Wobbler into meal time. 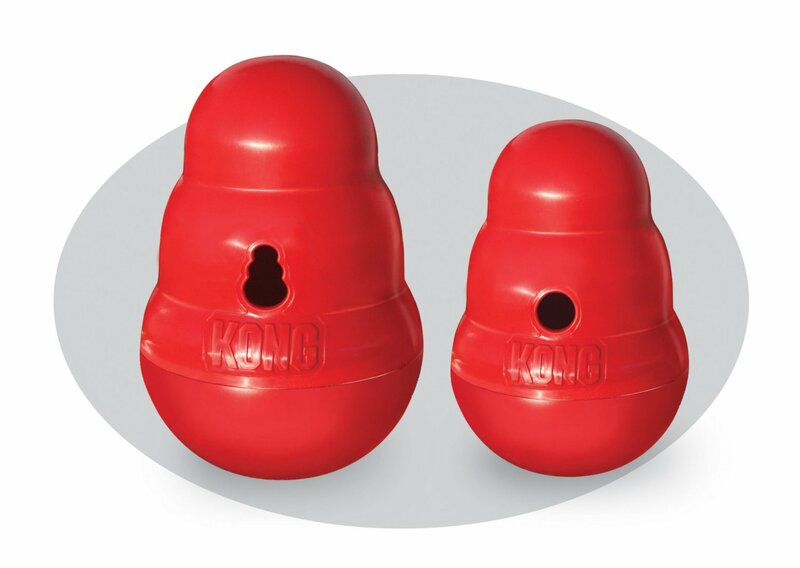 Basically it’s a hard plastic Kong shaped toy that you fill with food; the dog nudges it around to slowly get food from the opening. 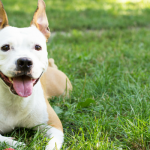 It’s great for dogs who scarf down food, it automatically slows them down. It’s also some great added mental stimulation for high energy dogs. Something as simple as making your dog work for their food really does mentally challenge them. As I mentioned before dogs that eat fast might become prone to bloat; the Kong Wobbler is one guaranteed way to slow them down. My dog is a large breed and she eats Blue Buffalo or Taste of The Wild kibble, both foods fit into the size large easily. I have read some reviews complaining about the size of the hole being too large for their kibble so you may want to consider a smaller size Kong or do what they did and use some tape to cover up some of the opening. It fits her 2 cup meal perfectly, it’s how she gets her dinner every day. It’s a little bit on the heavy side so if you have an excitable dog you should expect some heavy banging around. She still gets excited every time I get it ready. Since it comes apart in two big pieces it’s really easy to wash. You just have to watch out if you have a large dog with strong jaws, they can destroy these things if not supervised. Would I Recommend The Kong Wobbler? Adding a little bit of challenge to my dogs dinner is added mental stimulation for her. 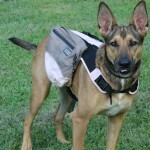 When living with an active, high drive dog that’s quite invaluable. She enjoys using it; it’s a little extra workout for her brain each evening. Yes I would recommend the Kong Wobbler to anyone that’s looking for an easy way to help keep their dog busy and mentally fit. 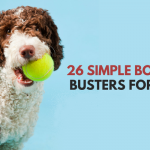 If you’re looking for more ideas to keep your dog busy check out our 33 easy activities to keep your dog busy indoors. Don’t just take my word for it. There are over 1000 reviews of the Kong Wobbler on Amazon. Out of 5 stars it currently has a rating of 4.3. Not too shabby. 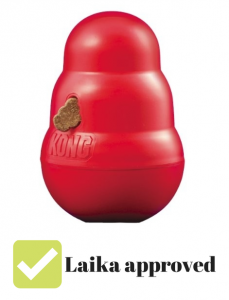 If you’re looking for an easy way to keep your dog busy I would definitely recommend a Kong Wobbler – and I know Laika would agree. If you’re looking for tough dog toys in general, rather than a food dispenser, check out our top 7 tough dog toy recommendations.